I had seen the movie as a kid with my mother, who has loved classic movies. I have read the book many times during my school years. The film and book paint the ugly racial realities in 1930s America from the view of Scout as a young girl and as an older woman. Although Atticus Finch, Scout’s father, might be viewed as a hero in a lost cause, Scout, Jim and Dill are the ones who saved Atticus and Tom Robinson, his client, from an angry mob. It’s interesting how the scene moves from anger to uncomfortable to shame to calm. To combat evil required not force but a child’s innocence and love. Maybe that’s the beginning to the answer. I hadn’t planned to read “Go Set a Watchman.” I personally didn’t care whether “Watchman” revealed that Atticus had deep-seated racist beliefs. But L.A. Barntiz’s recent blog on “Watchman” had made me reconsider picking up the book. The past few decades have seen the rise of many books, films and TV shows that have twisted, parodied and played off the classic fairy tales. Some of these are very good. But we have spent so much time making fun of the classics that we have failed to look back and appreciate the classics. One of my former co-workers commented that she had seen all the films spun off from “The Wizard of Oz” but she never watched the original. We revel in overturning ideals and high standards, but how do we know that we are progressing or growing without them? People failing to reach those ideals never negate them. As far as I can tell, America still strives for racial harmony. It means that plenty of work remains for us. 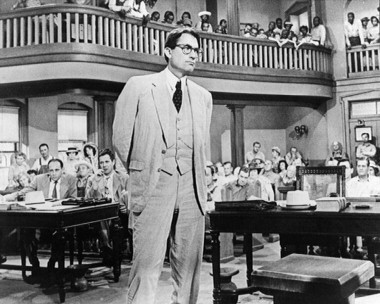 Even if it’s true that Atticus had racist beliefs, doesn’t that make his efforts in “To Kill a Mockingbird” more noble because he was able to set those beliefs aside briefly to defend Tom Robinson to the best of his ability? As I read “Go Set A Watchman” between visiting blogs, I’m struck by the fact that, to me, the writing is nothing like “To Kill a Mockingbird”. The voice, the style, the characters just do not resonate the way Mockingbird does and I can’t help but doubt that the authors are one in the same person. But yes, you’re right. We do have need of writings expressing all aspects of life and perhaps reworking a character to show other underlying qualities, not seen in one reading is a broadening experience. And perhaps a much needed one if we are to examine our own complicated motivations, especially in regard to important social and political issues of the day.